After being on trial for around three months, Google has finally moved from field trial to beta and enabled 'open sign-ups' for Google+. What this means is anyone can now sign-up for Google+ without needing an invitation to do so (as was the case earlier). This is good news for Indians since Google+ has seen rapid adaptation from the Indian user ever since it was first launched. According to comScore data, India was the second largest market for Google+ (after US) with 2.8 million visitors in just the first three weeks since Google+ appeared on World Wide Web. "For the past 12 weeks we've been in field trial. We're nowhere near done, but with the improvements we've made so far we're ready to move from field trial to beta, and introduce our 100th feature: open signups. This way anyone can visit google.com/+, join the project and connect with the people they care about," Vic Gundotra, Senior Vice President of Engineering at Google wrote in a blog post. Additionally, Google's very own messenger that was earlier called Huddle has been renamed to Messenger (so predictable). Google has also added a number of new features to the project; let's have a look at some of them. 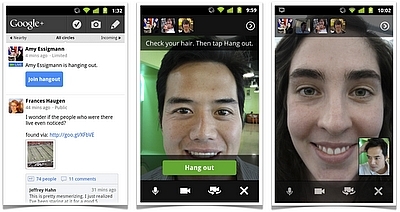 A new feature called Hangout has been added which enables live video chat among Google+ users. This feature was first launched only for PCs but now it has also been introduced on mobile phones. Although there is a catch; currently it only works on Android 2.3+ (Gingerbread) devices with front-facing cameras, but Google is planning to update it so that it can also work on Apple's iOS. Hangouts can also be used for public broadcast with Hangouts On Air. Users can do this by starting a normal hangout, then choosing the option to broadcast and record their session. Once they are "On Air," up to nine people can join their hangout (as usual) and anyone can watch their live broadcast. Initially, the number of broadcasters will be limited, but any member of the Google+ community can tune in. Hangouts already has a basic set of in-room actions like group chat and co-viewing of YouTube videos, now Google has added Screensharing (people can see what's on your screen), Sketchpad (for drawing etc), Google Docs and Named Hangouts (with which people can join or create a public hangout). The new additions are still under construction but Google has enabled them for getting user feedback. Additionally, the company has also released a basic set of Hangouts APIs for developers to experiment with. The company has brought Google's search expertise to Google+. Now users can type whatever they are looking for into the Google+ search box, and Google will show relevant people and posts, as well as popular content from around the web. Improved SMS support: users in the US and India (more countries will be added) can now post to Google+, receive notifications, and respond to group messages via SMS. To start texting, just verify your phone number in Google+ settings. Improved +mentions support: If you want to add someone in your circles to a conversation (or simply get their attention), you can now + [their name] inside a post or comment. Customization of notifications: Users can also decide which notifications they want to see (or not) on their mobile phones. But the most useful addition according to me is that users can now move the Google+ app to SD storage on Android devices, making it possible for them to install lots of apps and take lots of photos among others things, without worrying about the internal memory of the device running out of storage space.